It's a Wintry Afternoon﻿ and I was thinking of making some Hot Chocolate and serving it in my Chocolate Pot. 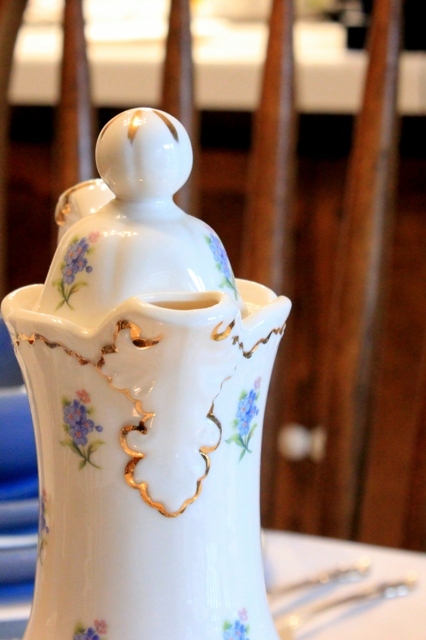 The history of the Chocolate Pot. My sweetheart and I moved to a very small town a few years after we were married. I had a small child and didn't know very many people, so I thought I would join a ceramic class and meet some new friends. In fact, I joined about this same time of the year. The weather was cold and dreary and I was lonely. I went to eight classes. One each week. 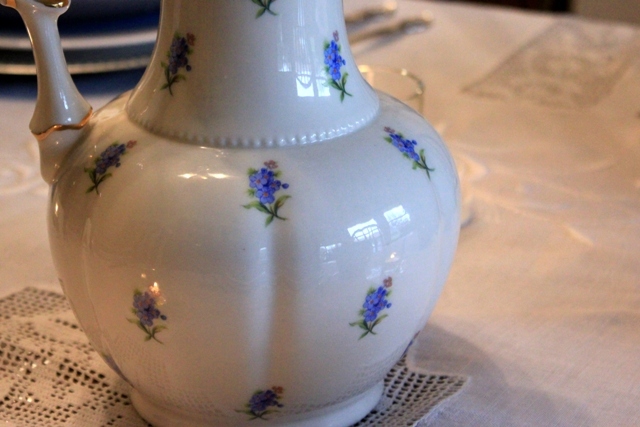 I wanted to make something special so I decided to make a porcelain Chocolate Pot with blue flowers. I thought it was "Very French" indeed.... That's interesting, now that I think about it, I have never taken another ceramic class again. Hum.. I'm going to have to ponder over that one. 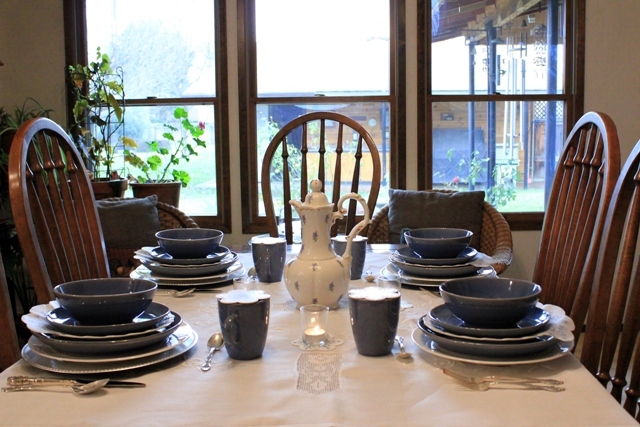 Today I set the table with a four place setting, because the blue dishes belong in our RV and I borrowed them for this Wintry tablescape. 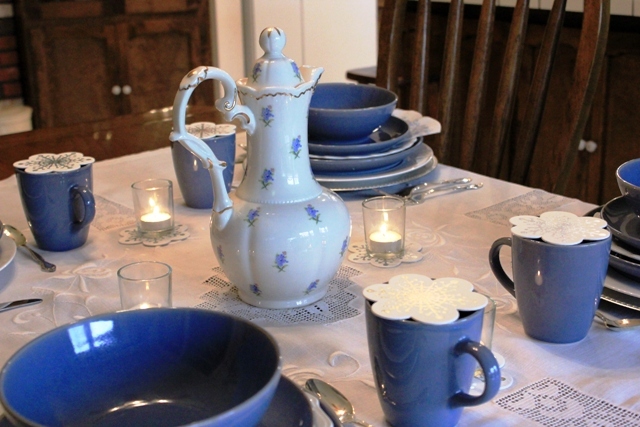 I wanted the tablescape to look wintry blue and snowy white. 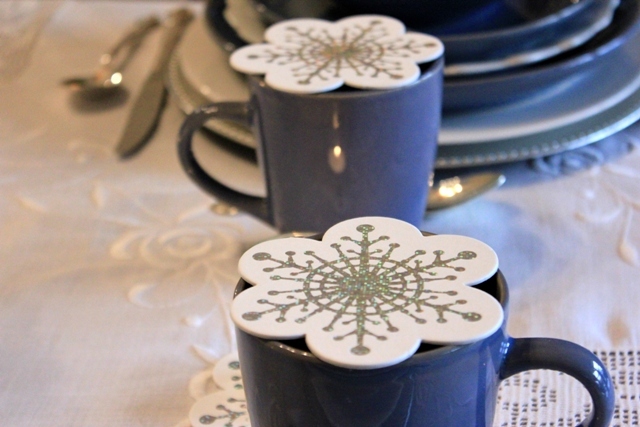 I found these cute snowflake coasters at the 99 cent store and I thought they would give the tablescape a wintry look. The mugs are excellent to serve some Hot Chocolate for the Wintry Afternoon. 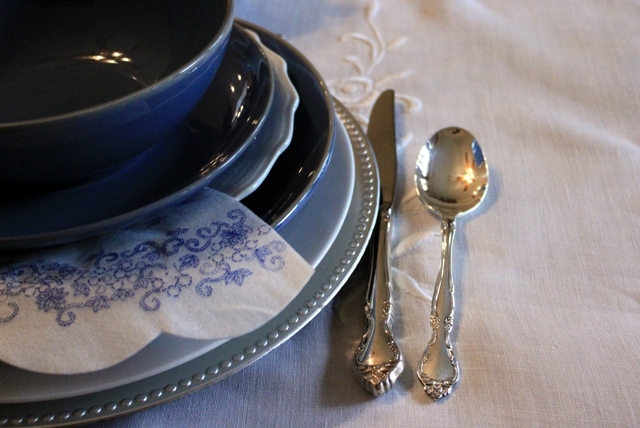 I'm going to be on the lookout this year for some wintry dishware to use in my January post next year. The process of this pot was made it three stages. 3. Paint the gold leaf on the pot - fire (I thought about the gold leaf. I think it was gold paint. I can barely remember the small bottle that was so expensive and I was so very careful not to spill it). There might have been more things to do, but it's been 45+ years and If anyone does ceramics now I'm sure things have changed a lot and my memory isn't that sharp anymore. 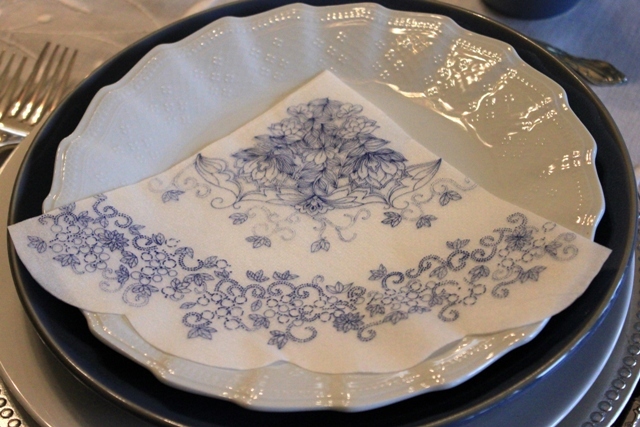 The blue and white napkins are made of rice paper. They are very thin and have an English flair to them. A close-up of the gold leaf (gold paint) detail. And, I didn't have to sell any of my jewelry to buy the gold paint. Of course at that time I didn't have any jewelry. When I look at these photographs and can't believe I sat and painted this pot. It's Amazing. The blue flowers were very difficult to apply to the pot. I do remember it took a couple of classes to finish applying the flowers. The vintage white tablecloth is a square card table size that I found at an estate sale. I came home and soaked it in linen cleaner and now it's just precious. Wintry Blues and Snowy Whites are a wonderful combination with Hot Chocolate don't you think so? I hope you have enjoyed your visit today. Please link back to the great blog hosts. Beautiful! I have long wanted a chocolate pot. Yours is really gorgeous. You did a wonderful job on it. I also love the whole wintery look of the table. I think blues and whites (especially that shade of blue) are very January~ish. 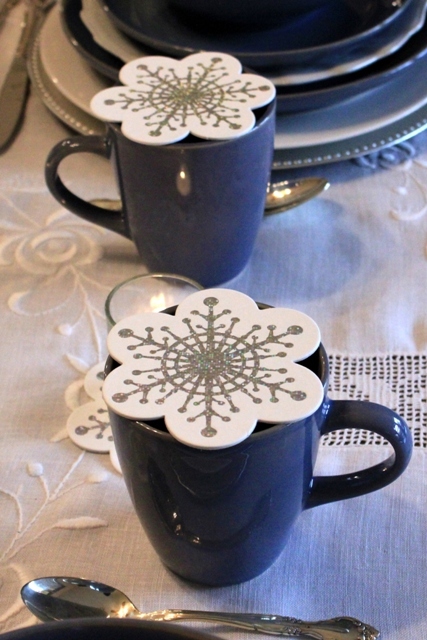 And I really like the little snowflake coasters on top of the mugs to keep in the heat. Very cute! That is a lovely tablescape. I can't imagine that you made the chocolate pot. It is just gorgeous and a family treasure now. Great post. Oh! I'm crazy for your teapot! I want one! Pretty table too. This is such a perfect post for a wintery January, and the blue and white really do represent the season. The chocolate pot is gorgeous....you did a great job...you should do ceramics again...although the Ceramic Shops of back then are few and far between these days. I know of one in my town that is still in business. I haven't been in a very long time, but your post reminds me of how much I enjoyed China Painting. 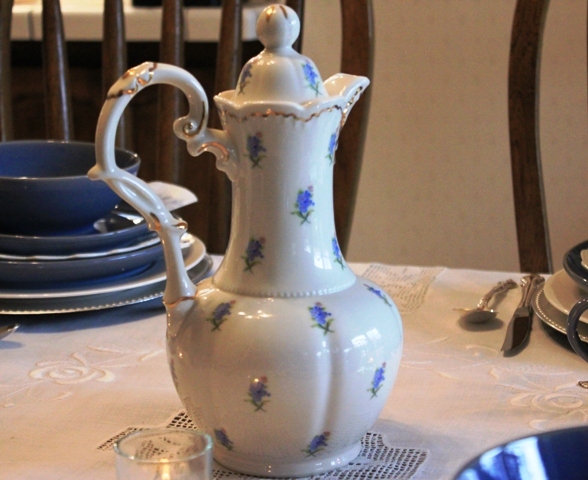 Beautiful, warm and inviting...your blog and Tablescape #17. Betty! You have got to be kidding me... you painted that pot??? It is divine! 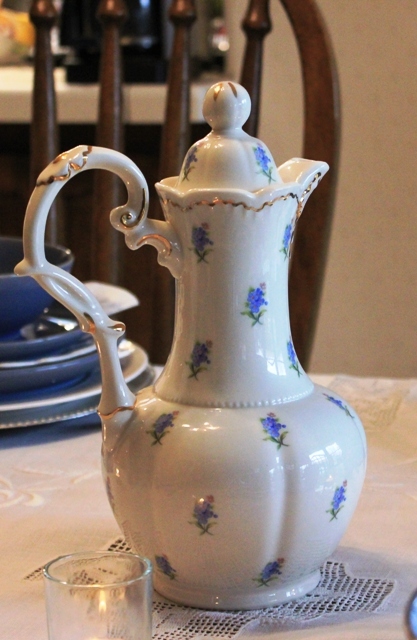 There is nothing I love better than a beautiful chocolate pot, and the shape and the flowers on that are perfection. I enjoyed seeing this, but I enjoyed it even more knowing that you painted that chocolate pot. Surely it is destined to be an heirloom to be passed down and loved. 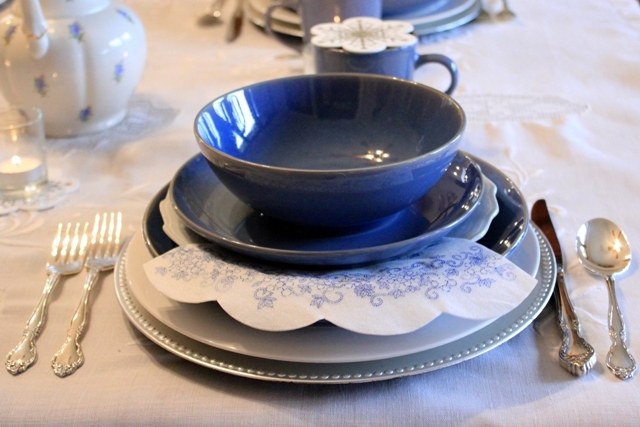 I'm crazy about blue and white so I enjoyed this whole tablescape, too. Hi there! Thanks so much for linking up to Treasure and Trinkets Thursday, I'm so glad you did! Hope you have a wonderful day and thanks again for linking up, hope you'll come back next week! Great day!..I love this pot! And you made it and painted it too,you are AWESOME!!! 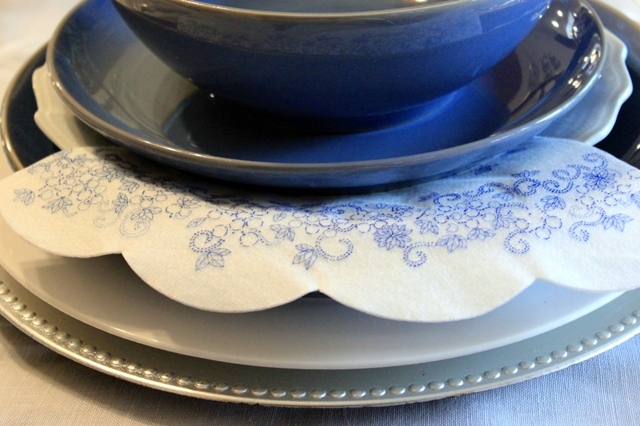 =Love your table scape, blue is one of my favorites. P.S. looking at all this chocolate made me hungry,got to go eat something(chocolate of course). Love the blue and white. My favorite color. I have china painted and think you did an amazing job. ohhh I love that chocolate pot! lovely! and so is the table setting! awesome! Love that chocolate pot and your whole setting - so perfect for Friday Pretties. Will be back and am your newest follower ;) Have a great weekend! How talented you are! I love your chocolate pot. It's wonderful that you still have it. I love your chocolate pot ~ it is just beautiful!! 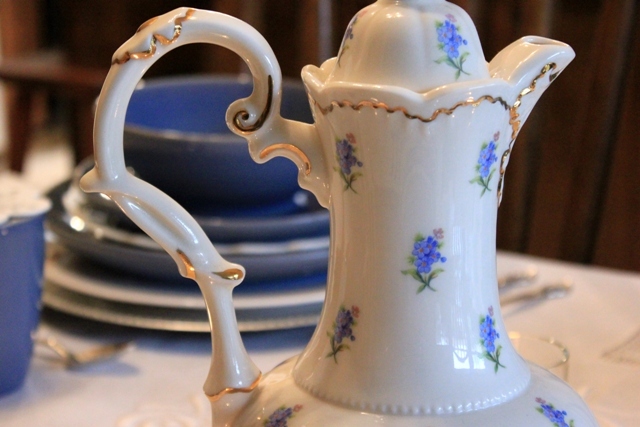 Your chocolate pot looks like a very expensive heirloom that was passed down to you by a great grandmother. It is so pretty and such a treasure. I love your table scape. Your chocolate pot is adorable. What a great piece to have. You really have a treasure! Your sweet little pot is just darling! What a wonderful homemade keepsake. You must be so proud of it. I also love those sweet delicate napkins. So pretty. Your Chocolate pot is quite lovely! You should take another ceramic class, you are very talented. What an awesome chocolate pot. I can't believe the detail. I think you need to look into another class. Who knows what you'd create?? I am SO AMAZED at your GORGEOUS Chocolate Pot!!! If you had said it was from a little antique shop in Paris and you had to pawn the family silver to buy it, "I would have believed you"!!! You DO KNOW it has stolen the post! Your table is beautiful BUT your "Chocolate Pot is a Masterpiece"!!! Thanks for sharing your "Friday Pretties"...I love all of them!